Kids arriving in a Frozen costume will be given a ticket. Shortly before the movie starts, 10 numbers will be drawn for regular winners, and then one super number will be drawn and that lucky person will be the town’s Frozen royalty. Lindsey and Derek Kroeger hold Dylan and Emma at Movies in the Park. As they planned the contest, MITP organizers Andrew Frew and David Williams realized that many of the kids might have the same costume, so a drawing seemed the fairest way to select the new ruler of the kingdom of the Palisades. The free movie this Saturday night, Aug. 20, will be Batman, the 1989 version starring Michael Keaton and Jack Nicholson, starting at sundown. The movie, which is shown on the Field of Dreams at the Palisades Recreation Center, is sponsored by Dr. Emma Kim, a dentist in the 881 Alma Real building. 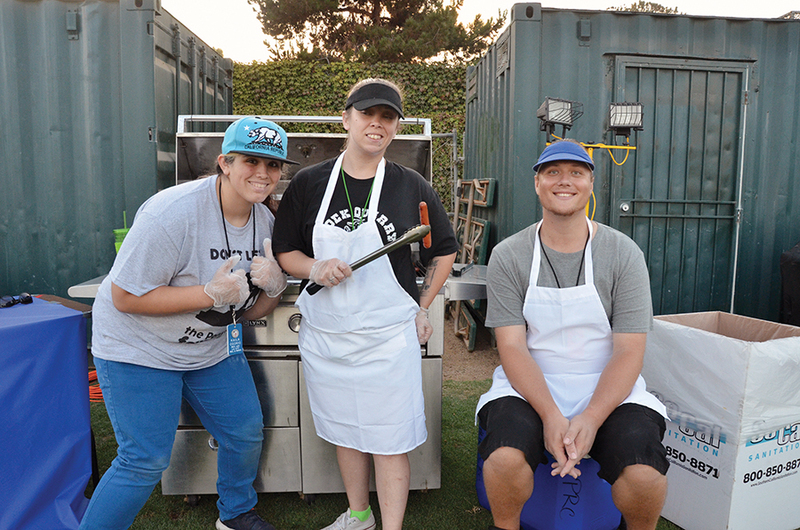 The traditional free hot dogs, served by Recreation Center employees, are paid for by Mike Skinner, who was a key leader in the local campaign to fund and build the Field of Dreams. 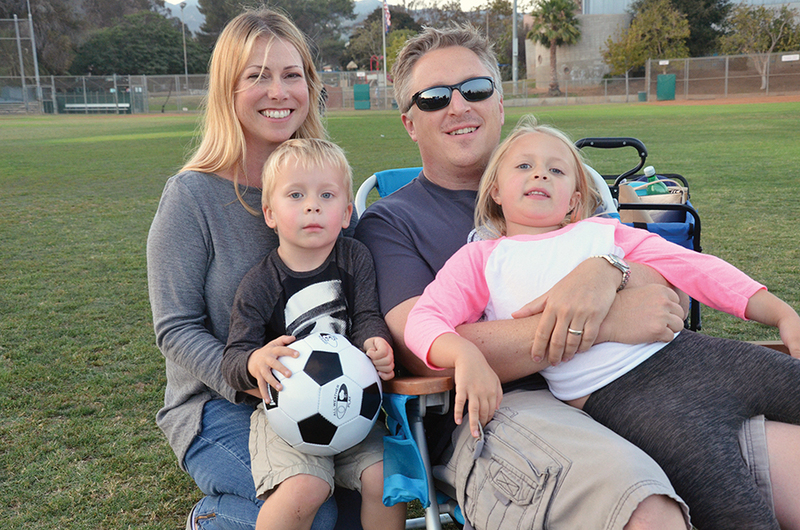 Typical of those attending the Aug. 6 movie (Indiana Jones) were the Kroeger family: Derek, Lindsey, Dylan and Emma. “We come every year to as many as we can,” mom Lindsey said. Christina Vonderohe attended with her husband, Peter Gratzinger, and their four children. Nine-year-old Max was asked to name his favorite MITP movies. “I liked ET, Harry Potter and Back to the Future,” he said. Eagle Scout candidates Emmet Kallmeyer and Gregory Gold are selling candy, water, Gatorade and chips at every movie. They hope to earn enough to fund their projects: a bench for the Palisades Presbyterian Preschool and a cage for the planting beds at Marquez. This year, Gelson’s is giving away free reusable shopping bags and $5 coupons to the first 400 moviegoers, and Santa Monica UCLA Medial Health Center and Orthopaedic Hospital is giving away small plastic blue footballs to the first 400 on the field. Movies in the Park, a nonprofit founded in 2004 by David Williams and John Wirth, and joined by Andy Frew and Brad Lusk, raises funds, selects the movies, creates the on-screen and audio ads, and advises youth volunteers. Working with them as a volunteer since MITP’s inception is Marilyn Crawford, Palisades Chamber of Commerce administrative assistant. The movies are supported by donations from the Pacific Palisades Woman’s Club; Gelson’s Market; Dan Urbach Real Estate; Jody Fine Estates; SEIA Estate & Investment Advisors; Botham Plumbing & Heating; Pacific Palisades Baseball Association; Bambino, the babysitting app; Optimist Club; Areté Preparatory Academy; Kehillat Israel; Amalfi Estates; and Horusicky Construction Company.